The cover of the June 8, 2000 cover of Autosport has in big red letters “OUT”. Jenson Button was to lose his seat at Williams in 2001 to Juan Pablo Montoya. Jenson was the rookie sensation in 2000 at Williams in only his third season of single seater racing but he was to lose his seat to the 1999 CART Champion and 2000 Indy 500 Winner Juan Pablo Montoya who Williams had an option on which came from Alex Zanardi’s move from Ganassi to Williams in 1999. It was said that Williams were looking for someone to blow current driver Ralf Schumacher away and they expected Montoya to be the guy after his two stellar seasons in America. So, was it the right decision? Montoya and Button raced against each other in F1 from 2001 to 2006. Montoya raced for Williams from 2001 to 2004 and McLaren from 2005 to 2006. During that same time period, Button raced for Benneton/Renault from 2001 to 2002 and BAR/Honda from 2003 to 2006. In 2001, Montoya won one race and finished 6th in the World Driver’s Championship while Button had no wins and finished 17th in points. So it was clear in the year after, that this was the right decision. During Montoya’s Williams years he had 4 wins and finished 6th, 3rd twice and 5th in the WDC while during that time period Button had no wins and finished 17th, 7th, 9th and 3rd in the WDC. In 2005, Montoya joined McLaren and had three wins and finished 4th in the WDC while Button remained winless and finished 9th. In their final year together in F1, Montoya had no wins and finished 8th in the WDC while Button got his first win and finished 6th. In their time together in F1, Montoya won 7 races and had an average WDC finish of 4.8 while Button had 1 win and an average WDC finish of 8.5. So it’s clear based on the comparable numbers that Williams made the right decision. However, after Montoya left F1 for Nascar in 2007 things began to change. After two horrible years in Honda, Ross Brawn bought the team and Jenson became world champion in 2009 with 6 wins. Since moving to McLaren in 2010, Button has had eight wins and appears to have a chance to increase the total in the next few years. So did Williams make the right move? At the time yes, Montoya was on fire after his CART title in 1999 and his dominant Indy 500 win in 2000. 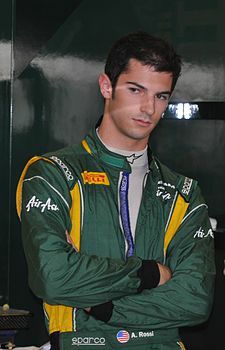 He was proven in F3000 and had the makings of being the next big star in F1. Looking at the time Montoya and Button spent together in F1 the decision was correct as Montoya had the better statistics. Button’s star didn’t shine until 2009 when he was given a lifeline (and a dominant car) by Brawn. 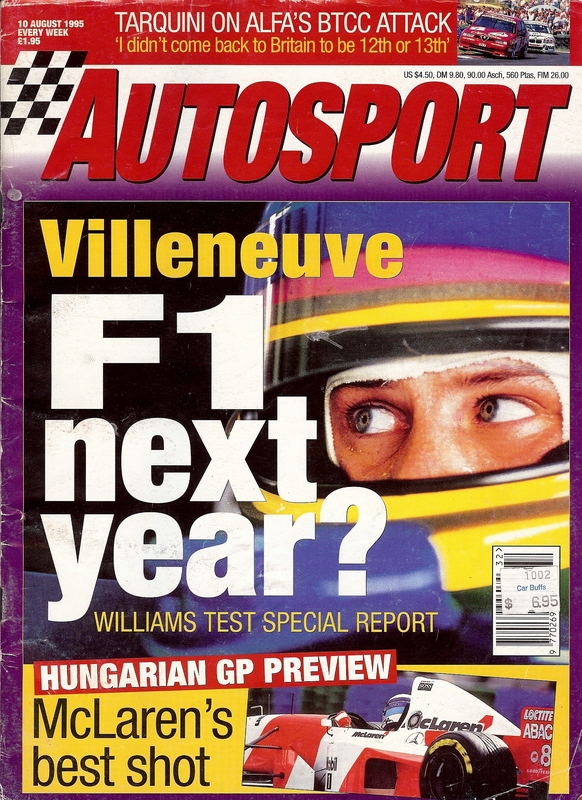 The top story from this issue of Autosport was speculation of the return of Alain Prost to F1 after it was announced he would carry out testing and development work for Mclaren during the 1995 season. As it turned out, Prost would not return to F1 racing and the seat at McLaren was taken by David Coulthard. In Class 1 Touring car news, Jason Watt is being watched by both Opel and Mercedes for 1996 after his dominance in the Formula Opel Euroseries. Watt was a star in the making before being paralyzed in a motorcycle accident in 1999. While his racing career continued after his accident it’s something to ponder what he could have done if he didn’t get paralyzed. Nigel Roebuck’s Fifth Column is a tribute to the retiring Keke Rosberg. Roebuck reflects on memories of Keke during his time at Williams in the early 1980’s. Nigel talks about Spa 1983 when Rosberg finished fifth driving the wheels off of his naturally aspirated Williams against all the other turbo cars. Across the pond, Andre Ribeiro wins the New England 200 in New Hampshire giving him and Honda their first Indycar wins. 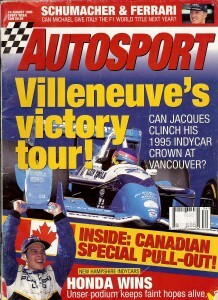 Points leader Jacques Villeneuve finishes fourth, which means he only needs to finish fourth at the next race in Vancouver to take the title. 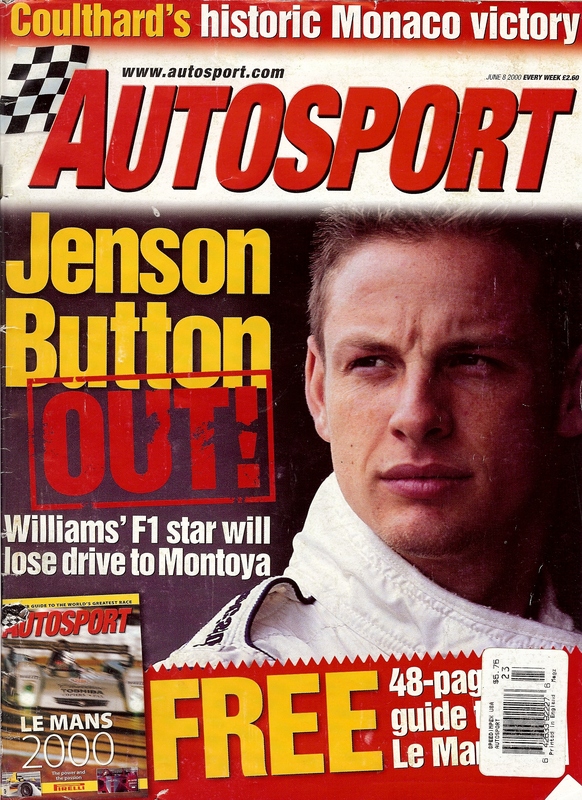 Autosport celebrates their 45th Birthday looking back at where the magazine has been over the past 45 years and reflections from various contributors. In British F3, Cristiano da Matta wins the race at Oulton Park after Ralph Firman jumps the start. Other finishers include future Red Bull team boss Christian Horner in 8th and future Corvette GT star Ollie Gavin in 13th. If you’re a fan of motorsport, you’ve probably seen it or heard about it by now. Robert Kubica’s amazing win on the ERC’s Janner Rally. Kubica came back to win the rally by nineteen seconds after going into the last stage down eleven seconds to leader Vaclav Pech. Kubica went half a minute quicker on a foggy night stage to take the rally win. I repeat, Kubica went thirty-seconds quicker on a foggy night stage driving flat out and at one point missing a pace note, dealt with broken driving lights and almost having an off. Kubica’s talent clearly shines in the video of the last stage, what was just as classic was his non-chalantness after finding out how fast he went and that he won the rally. It’s unfortunate that Kubica was unable to fulfill his potential in F1 between driving what many would consider not top flight cars and the rally accident that almost caused the amputation of his arm and the end of his F1 career. Many rated him a star in the making in F1 and Lewis Hamilton considered Kubica the driver who gave him the hardest time during their years in junior formulas. Many expected Kubica to end up being Alonso’s teammate at Ferrari before his unfortunate incident. F1’s loss is the World Rally Championship’s gain. Over the past few years, the WRC has lost it’s luster between poor management and promotion, lack of manufacturers and dominance by guys named Sebastien. Perhaps Kubica can raise the standing if he performs well; going off of experience, the talent is there. Can he make the most of the situation? Some may look at Kimi Rakkionen’s foray into world rallying and give that as the example as to why Kubica won’t succeed. The difference between Kimi and Robert is that Kubica seems fully committed to it whereas with Kimi it was just something to hold him over until the right F1 money came along. In addition, it was said by people in the WRC that Kimi didn’t care about listening to pacenotes. Do I expect Kubica to win this year? No, I think 2014 will be learning year, there will be times when he shows the ability to be a front runner and times he bins the car due to a rookie mistake. 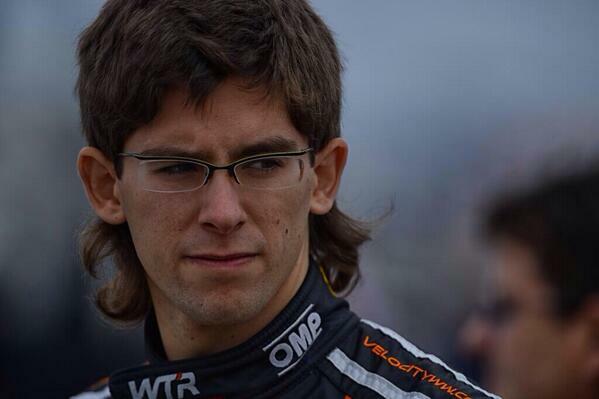 I also question if M-Sport can give him the car to run upfront. M-Sport who was once the works Ford WRC team lost their Ford funding and has developed their WRC Fiesta with private funds. How did two of these end up in GM’s collection? I was doing some web surfing on Christmas afternoon: sitting on my parents couch, one eye on an NBA game and smelling the ham in the oven when I came across an old news item. Remember when GM did some cleaning and sent some of the cars from their Heritage Center Collection to the Barrett Jackson Auction in 2009? I was looking over the list of cars and two items stuck out. Two Grey 1985 Peugeot 205 Turbos. Why would GM have two Group B Supercars in their collection? I know manufacturers buy each others cars to get an up close and personal view of what everyone else is doing but it’s strange to own two cars that were of very limited production and not for sale in the US at the time. Was GM thinking of making a Group B Opel to fight the 205 and others on the WRC stage? Looking at this closer, one of the cars is listed as “Active”. During the second half of the 1980’s GM was heavily involved in developing “active suspension”. GM had a fleet of Corvettes developing and testing the system in hopes that it would debut on the 1990 ZR1. The system (which was also being developed by then GM owned Lotus) was used in the Corvette GTP cars being raced on the IMSA circut. Perhaps these cars were used as mules to develop active suspension for the Corvette and at the end of their time ended up in the GM collection. A quick search of Mr.Peel online found that he worked for Lotus as a development engineer in consultancy work and later became engineering sales and head of Communications. So I sent an email to Mr. Peel and here’s what he had to say. This was indeed all to do with the engineering relationship between GM and Lotus. The Active Suspension development originally conceived for the F1 team in 81/82 became a major technical offering for Lotus Engineering which ultimately grew into a suite of active systems for vehicle dynamics control. By this time we’d already built several cars with active suspension for GM – the first contract was for a couple of sedans as R&D cars, and we also did a truck as a show car. We’d also worked with Volvo and had sold an idea for creating active rear steer to them which worked incredibly well (it was at least +- 5 degrees of steer and may have been +-15 degrees – I can’t remember. But it was more than enough to control the steer response not just trim it.). So we had already gone beyond just active suspension. The concept we were working towards for the Indy was ‘active everything’ – suspension, rear steer, front/rear torque distribution and front steer – and lots of performance. So we needed some new tech and some mule vehicles to try it out on. We knew we needed some cars that would have lots of performance, four wheel drive and ideally quite easy to modify. We did look at building something from scratch but not for this project – so we looked at the then current crop of Gp B rally cars and analysed all the cars around at the time. 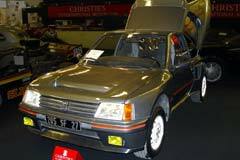 The Metro 6R4 was a possible as was the Ford RS200 but we eventually bought the last two 205 T16’s from Peugeot Sport (Andre de Cortanze was my contact). We also decided that the 240bhp of the ‘standard’ car wasn’t enough, bearing in mind the power drains from the hydraulic systems and the added weight, so we bought the Club upgrade which gave us 300bhp. We modified the four-wheel drive with a second differential driven by a hydraulic motor (check out a Tamiya model tank drive system to see what I mean – that’s what we did!) so that we could control exactly the speed of the front axle compared to the speed of the rear axle and therefore control slip. To do so, we had to compare wheel speed and true vehicle speed (longitudinally and laterally) which was a challenge – we ended up using two Leitz Correvit optical speed sensors mounted behind the passenger seat. They were a bit like two massive telephoto lenses and were a pig to install, calibrate and keep working. We had to calibrate the lateral speed sensor using a belt sander as a ‘road surface’ whose belt speed we could measure. One car was built with active suspension and the four wheel drive so we could sort that out while the second ended up with the steer systems as well, so it was the full mule for the Corvette Indy. Front steer was weird – basically the steering wheel could be mechanically disconnected from the steering rack (with an emergency reconnecting clutch if things went wrong…) and then it was just used as an input to the computer. You could have opposite-sense steer – turn the wheel to the right and the car would go left – or even load-steer when the wheel wouldn’t move but applying load one way or the other generated a steer response. And of course rear steer could play whatever static tricks we could dream up as well. Same-sense or opposite-sense giving crabbing motion or a very rapid rate of rotation with a small turning circle. In fact one of the silly party tricks was to apply full lock and full throttle and get massive burnouts in a ridiculously small circle – two very black very small concentric circles on the test track, not much bigger than the wheelbase of the car…oh and a dizzy driver! So once we’d sorted out all the systems, the main project was to build the Corvette Indy. I didn’t get involved with that one but I seem to remember there were some problems which made it difficult to run. Shame cos the systems were awesome. We were all very sad to say goodbye to the two Pugs when they were shipped to GM at the end of the project”. So mystery solved. The Peugeot 205’s in the GM collection were from the time when Lotus was testing active suspension for projects such as the Corvette Indy. Thank you Mr Peal for your response and solving an interesting mystery. Any other automotive mysteries out there, send them to Sons of Taki. 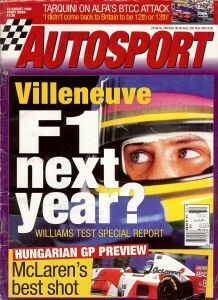 Villeneuve in F1 next year? Yes you are correct Autosport. 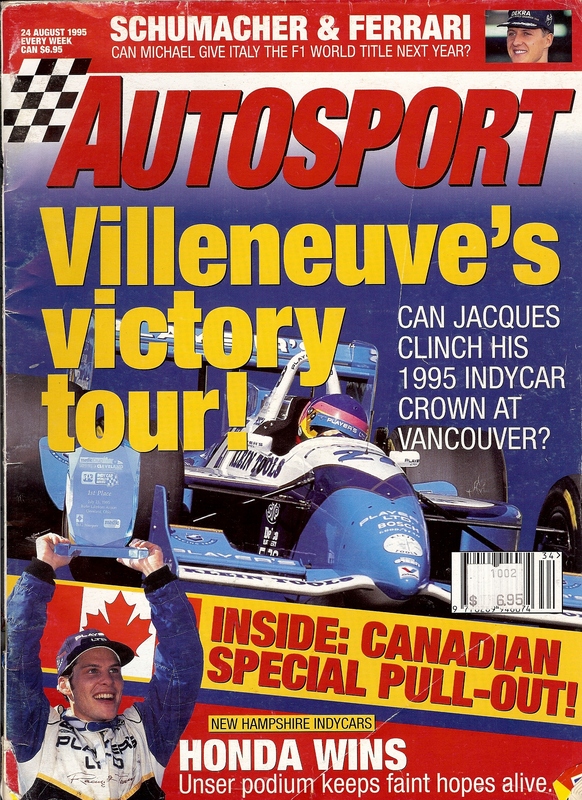 The top story is Jacques Villeneuve’s test with Williams and the possibility of him joining the team for the 1996 season. It’s believed that Williams has a right of first refusal on Villeneuve in F1 for the next three seasons. In addition, it’s reported that if he was join Williams he would be taking a paycut from his six million dollar Indycar salary. Can you believe that today, a top Indycar driver taking a paycut to go to F1 and a current Indycar driver making six million a season.? In other F1 news, Mika Salo is confirmed for Tyrrell for the 1996 season and Michael Schumacher gets married. In touring car news, recently crowned South African touring car champion Mike Briggs is announced to sub for James Thompson in the Vauxhall team at Brands Hatch in support of John Cleland’s title bid, Thompson was injured in a testing accident two weeks earlier at Knockhill. In this edition of the Fifth Column Nigel Roebuck reflects on seeing the son of his late good friend Gilles Villeneuve test an F1 car for the first time. Roebuck talks with Jacques about his first impressions of driving an F1 car after driving an Indycar. Jacques describes the car as “more nimble” and “much lighter”. Jacques says that the Indycar would not be much slower than the Williams at Silverstone as “it would be slower in the corners, yes but it would probably make up time on the straights”. This was in the era when CART cars were rocketships and provided possibly the best racing on earth. Nigel also gets a comment from Bernie Ecclestone after having dinner with Jacques saying “It was almost like talking with Senna again”. The Hungarian Grand Prix is previewed with Mark Blundell calling it an important race for Damon Hill and Simon Taylor predicting a Schumacher win. 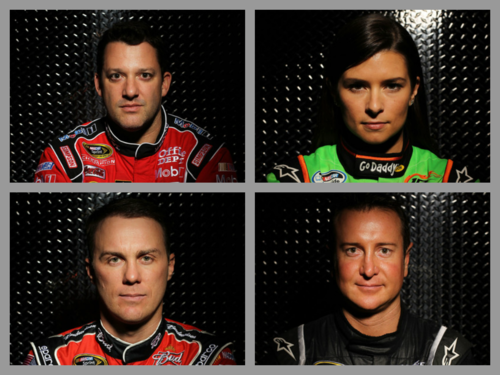 In the end Hill will go on to dominate the weekend winning the pole, setting fastest lap and winning the race. It should also be mention that this was the race when Taki Inoue was hit by a marshal’s car when attempting to put the fire out of the Footwork. Formula 3’s best were at Zandvoort to see who was the best at the Marlboro Masters. It was a familiar sight as the stars of the German F3 series dominated the occasion with Norberto Fontana and Ralf Schumacher going 1 and 2. Rounding out the podium was current Indycar star Helio Castro Neves (listed as Helio Castrol Neves). Other familiar names down the result sheet were Ollie Gavin in 4th, Max “The Axe” Angelli in 6th and future F1 driver Alex Wurz being caught up in a 2nd lap accident. Fontana was dominate in German F3 this year and many expected him to be a star in the making, however his F1 career didn’t pan out and only started four races in 1997 and is mostly known for blocking Jacques Villeneuve during the title decider at Jerez that year. At rounds six and seven of the ITC series at Estoril, Bernd Schnieder all but clinches the title by winning the first race and finishing second to teammate Jan Magnussen in the second race. Dario Franchitti, who is second in points plans to stop his AMG Mercedes team from winning the title by kidnapping Schnedier, locking him away and paying all the drivers to let him win. In the World of Sport section, Dale Earnhardt wins the second running of the Brickyard 400 and Richie Hearn closes in on Toyota Atlantic points leader David Empringham after a win in race two at Trois Rivieres,. Empringham is one of the guys when looking back saying “why didn’t he get a good CART ride, he won in Atlantics and in Indy Lights?” After Empringham won the Indy Lights title he never really made it to CART. With Mark Webber leaving the F1 paddock and joining Porsche’s return to top level sportscar racing; the question remains who will join Sebastian Vettel at Red Bull for 2014? The shortlist points to three men: Kimi Raikkonen, Daniel Ricciardo and Jean Eric Vergne with Ricciardo appearing to be the front runner for the seat. After the Multi 21 incident and with Webber’s announcement to join Porsche, many had Kimi as the frontrunner for the 2014 seat. He’s a free agent after ’13, has had Red Bull sponsorship during his Rallying sabbatical. In addition to the Red Bull connection, he is one of the most talented driver’s in the paddock and seems the most likely to not give “a hoot” about who his teammate is. The negatives are the first being it’s Kimi Raikkonen. As we’ve seen, Kimi is either on or off, if the car is on, Kimi can win. If the car is off, Kimi will float the bottom half of the points table, unlike Alonso who has the ability to be championship contender in a horrible car. Kimi will also want to cash in; is Red Bull willing to deliver the Brinks truck to Kimi? It’s been stated that Kimi is on a bonus heavy contract at Lotus. Could Red Bull handle having “two bulls in one field”? How would their poster child Vettel react to a driver who could possibly be his equal more than Webber and who wouldn’t be phased by the Vettel/Marko machine in a bit. Also, how would the PR machine of Red Bull and Kimi work together? If we were ranking the three drivers from most likely to least likely Jean Eric Vergne is the least likely of the three to be in the Red Bull in 2014. While Vergne has done a workman like job for Toro Rosso, he hasn’t had spectacular performances bar the Canadian GP. In all likelihood, I expect Vergne to be back at Toro Rosso at 2014, loaned to another team or be Red Bull’s full time Test Driver. 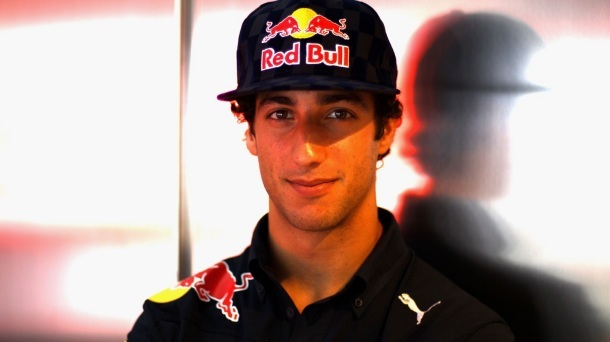 Out of the three, Daniel Ricciardo appears to be the most likely to be at Red Bull for 2014. Ricciardo has been fairly impressive for Toro Rosso with an uptick in his performance since the announcement of Webber’s departure. Ricciardo has been impressive in testing with Red Bull with even his teammate Vergne saying that Ricciardo deserves the seat at Red Bull. What helps Ricciardo’s case besides his performance has been it appears that Red Bull has an interest in Austrailia. Red Bull sponsors a V8 Supercar series, has sponsored former Moto GP champ Casey Stoner and currently has an Aussie in Mark Webber in the team. Replace an Aussie with an Aussie? Ricciardo would also help Red Bull’s driver program. It hasn’t been since Vettel that Red Bull has fully produced a young developed driver with all other young drivers being cast off after a year or two at Toro Rosso. Also, unlike Raikkonen, Ricciardo would not cost an arm and a leg. So, my money is on Ricciardo to be the new “2” in Multi 12. However, as a long run prediction, isn’t whoever gets the driver is just keeping the seat warm until Antonio Felix de Costa? 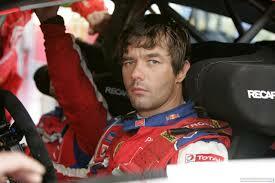 Sebastien Loeb is the best driver in the world today, there I said it. There is no one driving a car in the world today (and yes I’m including Lewis, Fernando and that other Sebastian) that has the overall ability to do what the man from Alsace can; to be so successful in various disciplines in a wide range of cars. Look at the facts, Loeb holds all the important records in world rallying (championships, wins, points and podium finishes). I know critics will say maybe the competition in world rallying was somewhat weak during the Loeb era but he was so dominant that in 2006 Loeb missed rounds due to a mountain biking accident and he still on won the title on his dominance when he was on the road. In addition to rallying, Loeb has finished second at LeMans, has tested F3000 and Formula 1 cars (almost competing for the Toro Rosso team), has won X-Games rallycross, and has been victorious in sportscar racing. In 2014, Loeb will be leading Citroen’s attack on the World Touring Car Championship. Recently, Loeb took part in the Pikes Peak Hill Climb, Loeb didn’t just win, he dominated; breaking the course record by a minute and a half and 49 seconds faster than his closest competitor. Loeb, didn’t retire from rallying because of a lack of form, old age or a Citroen pull out; it was due to accomplishing all that could be accomplished. Loeb has been making cameo appearances in the WRC this year and out of his three starts his results have been two wins and a second. So what makes this tick and allows him to be able to to be successful in multiple disciplines? First start by looking at his background. Growing up Loeb was a gymnast at a high level finishing fifth in the French championship. After his gymnastics career, Loeb trained as an electrical engineer in his late teens and early twenties. Both disciplines require focus, large amounts of concentration and the ability to adapt. The gymnast must be skilled in various things such as the floor exercise, the parallel bars and rings. The electrician works with live wires and various codes knowing a false move could injure himself and others. When Loeb appeared on the world stage he was viewed as a tarmac specialist, someone who could challenge for wins on sealed surfaces but an also ran on rallies that were featured on gravel and snow. Loeb developed into in all rounder, he was dominate on tarmac but won rallies such as Cyprus and Australia and became the first non scandinavian driver to win Rally Sweden. Is there anyone out there as talented as Loeb? Sure there are others who are/would be faster in a Sportscar or an Open Wheel race car, but is there anyone out there could be as competitive as Loeb has been jumping from discipline to discipline? Loeb is a throw back to an earlier day when the racing world consisted of men like Elford, Gurney, Jones, and Hill. Perhaps it’s because of contract restrictive specialist era we live in, we truly don’t appreciate Loeb’s talent.